This is historic, not only for Concordia University, but also for the Quebec student movement. It’s the first time an entire anglophone campus voted in favour of an open-ended general strike. This strike has the potential to make Concordia a big player in the fight against the Charest government’s proposed increases. But there’s a catch that undermines the effectiveness of the strike we voted to participate in—the CSU isn’t committed to a hard picket. “Be it further resolved that students will not make a line to prevent students and teachers from entering buildings to teach or learn,” read an amendment that was voted in without a discussion. Essentially, if students still show up to class, other students who want to respect the strike vote are being penalized for missing lectures. That amendment should have been called out of order right after it was proposed. 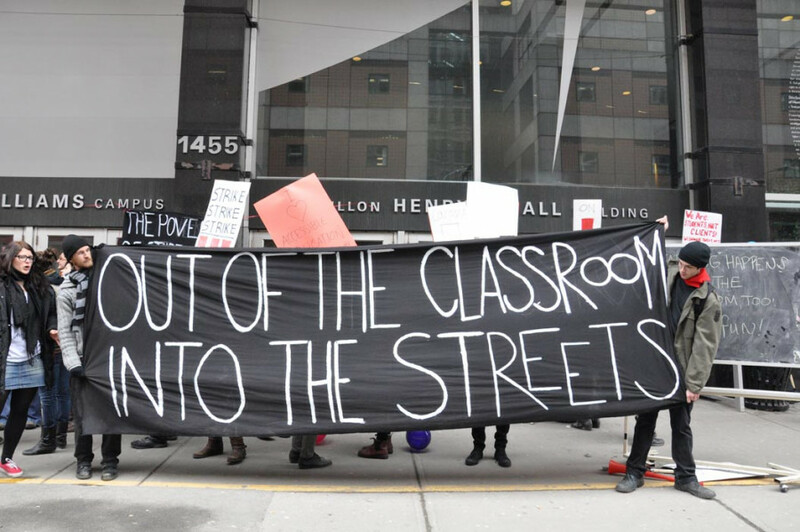 Unlike the labour unions, we do not have an anti-scab law (a gain from past labour movements) to enforce our strike mandates, which means student unions are responsible for organizing picket lines to enforce the vote. Why is it that other campuses with many buildings and entrances, such as the Université du Québec à Montréal, are able to have a successful strike? Is it because francophones are born with picket signs? Or is it because anglophone students are apathetic or unaware about how to properly strike? If Concordia students can’t organize a successful strike, there is no one else to blame but the student leadership. Last Tuesday, after a session of CSU executive-bashing at the de facto student strike committee, CSU President Lex Gill said that she is “not the CSU.” There’s some truth to that. At the end of the day, leadership isn’t just about the individual in the highest political position, it’s the collective grouping of all leadership positions—from departmental association executives, to faculty association councillors and executives, and the CSU councillors and executives. Having gone through the steep learning curve of student politics, it is the responsibility of students in these positions to represent the students of today and tomorrow. The tuition hike could have been predicted two years ago when Quebec’s debt-to-GDP ratio grew to 94 per cent, according to the Organization for Economic Co-operation and Development. In March 2010, the provincial government sought to eliminate its debt by 2014, not by taxing the banks and huge corporations that hoard the wealth created by society, but by passing an austerity budget to cut the social wage. In protest, 40,000 students under the umbrella union of the Association pour une solidarité syndicale étudiante held a one-day strike on April 1, 2010. If that didn’t send a clear enough signal, the 75 per cent tuition increase in universities passed in last year’s budget. Student leaders should have prioritized the education of their members and the mobilization for the inevitable unlimited general strike, a highly effective last- resort tactic. This is not to say that there aren’t any good student leaders out there, because many of them should be commended for their courage and determination. But when the government wages an ideological war to convince students to accept the tuition hikes, the student leadership needs to retaliate. With proper mobilization for hard pickets last week, students could have completely paralyzed the institution, truly lending their numbers to the province-wide unlimited general strike. There are still three weeks before classes end.